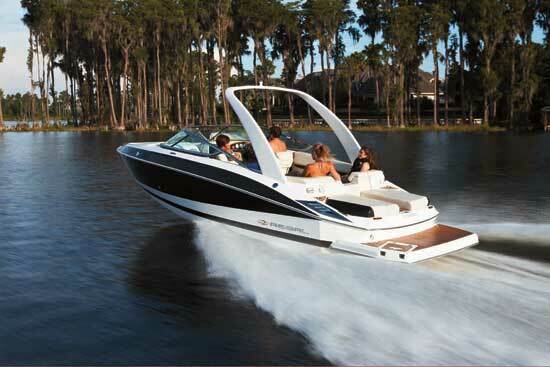 Regal’s new 29 OBX is a trendsetter that capitalizes on the benefits of outboard power. 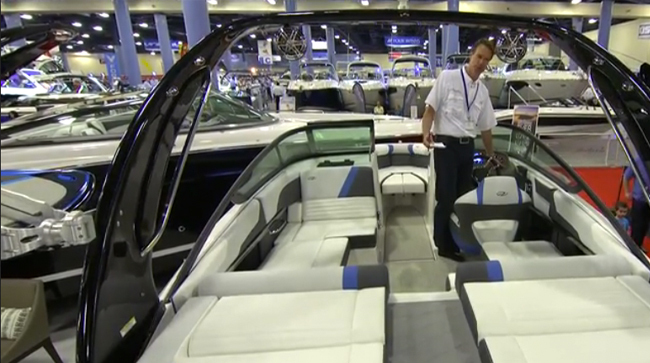 Walking the docks at this year’s Miami International Boat Show, a specific trend among runabouts and small cruisers was evident and undeniable: outboard power—have a look for yourself in our First Look Video. 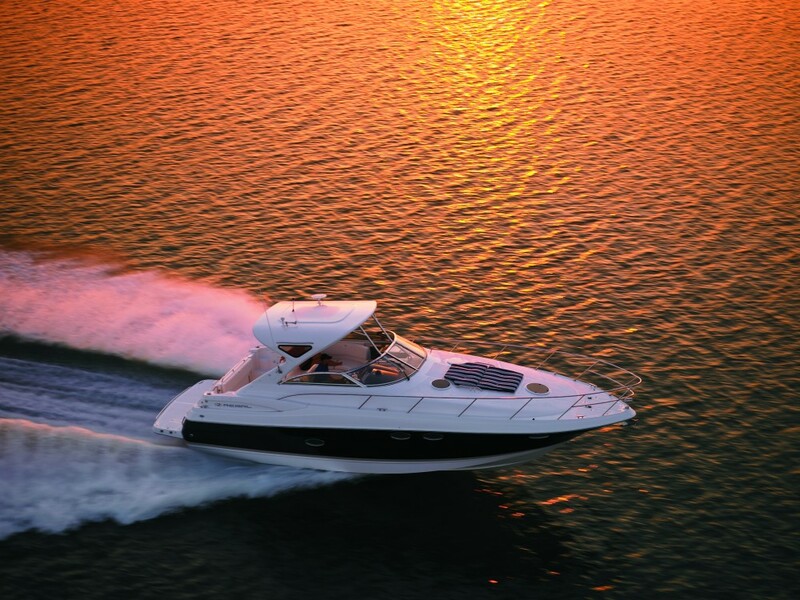 Outboards have been used on runabouts for a long time and they have been around even longer, but the level of sophistication in today’s outboard engines allows builders to deliver a boating experience as luxurious as that of an inboard. The latest engines are quiet, refined and odor free. Then, of course, there are the benefits that outboard power has always offered: ease of use, serviceability, and greater trim arc—you can’t get a stern drive fully out of the water, but you can with an outboard. 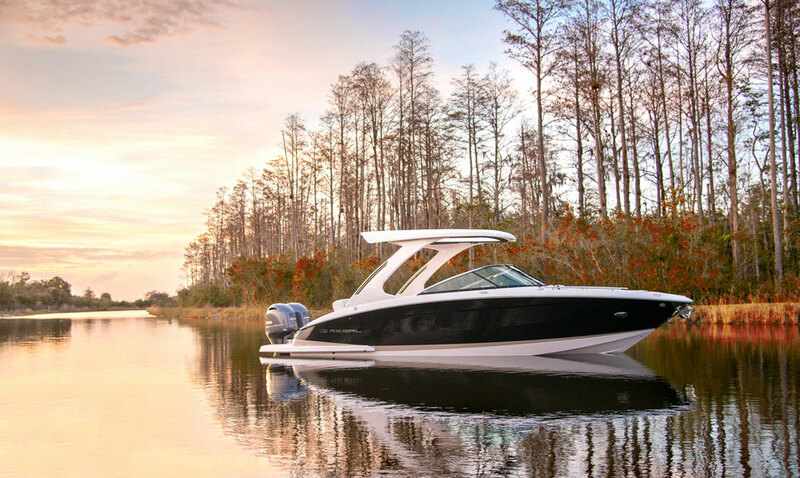 That’s all a nuts-and-bolts matter, but in the new Regal 29 OBX, designers capitalized on the creative freedom outboard engines also offer. Because the engines are as far aft as can be, they had the cockpit all to themselves, so to speak, and they came up with some nifty ideas. For example, the aft bench is convertible in a number of ways. It’s split down the middle, and each side features an adjustable backrest that locks in place to face forward or back and creates a flat sunpad or angled lounge. What’s more, Regal mounted the benches on a sliding platform—Regal calls it slide-away seating—that moves aft to offer a more spacious cockpit or forward to lengthen the swim platform. The aft benches are completely convertible and movable, making way for more storage room, more cockpit room, and a larger swim platform. The swim platform also has some inventive features. When the slide-away seating is fully forward—the length of travel is nearly a foot—a built-in cooler/wet locker is exposed. Regal designers also wrapped the platform around the engines to create a clear path to the water. For climbing back onboard, the platform includes a telescoping swim ladder to port away from the propellers. From a more practical perspective, Regal engineers included a massive stowage compartment beneath the slide-away-seating setup. With no engine to conceal, the area belowdecks at the stern is cavernous enough to hold a towable tube and nearly everything else you care to bring along—it’s a great feature the engine choice makes possible. 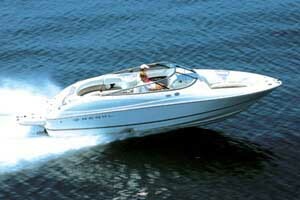 In terms of power, buyers have two options: twin 200 HP inline four-cylinders, or twin 250 HP V6 engines. Four hundred ponies should be enough to push the 29-footer around, but anybody who has ever owned a boat will tell you that more power is nice to have long after the sting of the price tag has faded. There’s also an option to get the engines painted white, which makes them look less, well, utilitarian. Looking to add even more style to this sleek runabout? 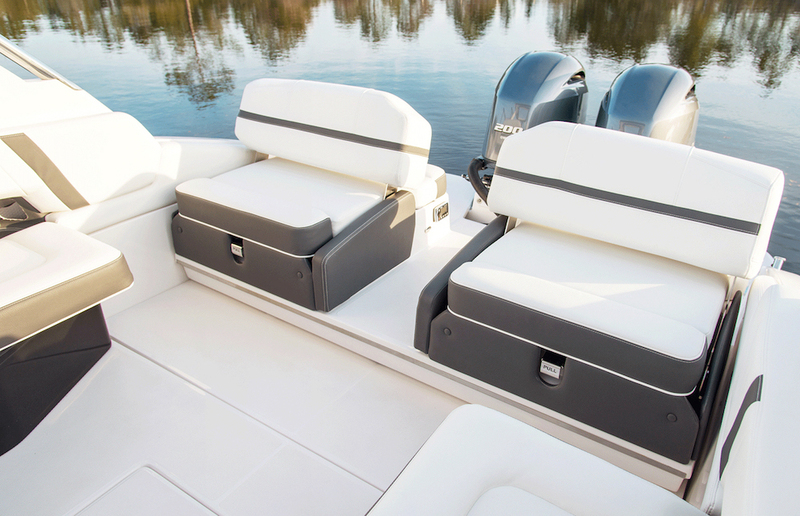 Consider taking advantage of the option to paint the outboard engines a crisp white. One aspect of the 29 OBX that could be limiting is the boat’s beam. It’s nine feet across, which is restricting when it comes to towing since most states’ maximum trailer width is eight feet six inches. Twenty-nine feet isn’t so long that you wouldn’t want to be able to trailer this boat around to your favorite bodies of water wherever you live. An eight-feet, six-inch beam would have solved that and not taken away too much interior space. In terms of add-ons, I prefer a lot of standard features over an extensive list of options, but one of the options available for the 29 OBX is pretty exciting. The hardtop keeps the sun off you like a Bimini, but it also features a retractable sunroof and an electric SureShade awning that extends aft—and it looks great and it’s hugely practical. Standard features include an enclosed head compartment, a wind dam between the windshield cowls and a cantilevered trash compartment beneath the helm. There’s also a pullout drawer above the garbage bin. Up front, the bow gets a nice, wide walk-through to a versatile seating layout, complete with folding armrests. There’s also a fully outfitted anchor locker, with an optional windlass. So often, what seems like a simple solution can pave the way for a bevy of other innovative ideas that follow. 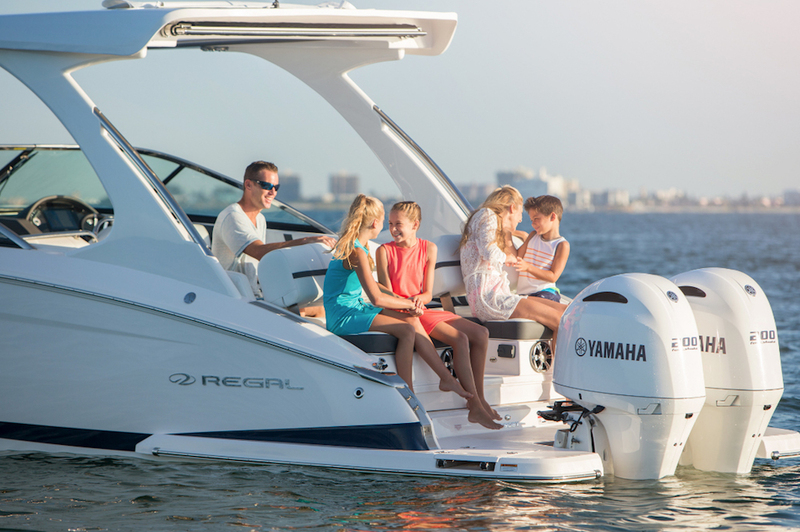 In the case of Regal’s 29 OBX, outboard engines are that simple solution,—so simple that Regal now offers outboards on all its runabouts. Outboards might be the hot trend on today’s runabouts, but there’s a good chance it’s a trend that will be with us for a long time. 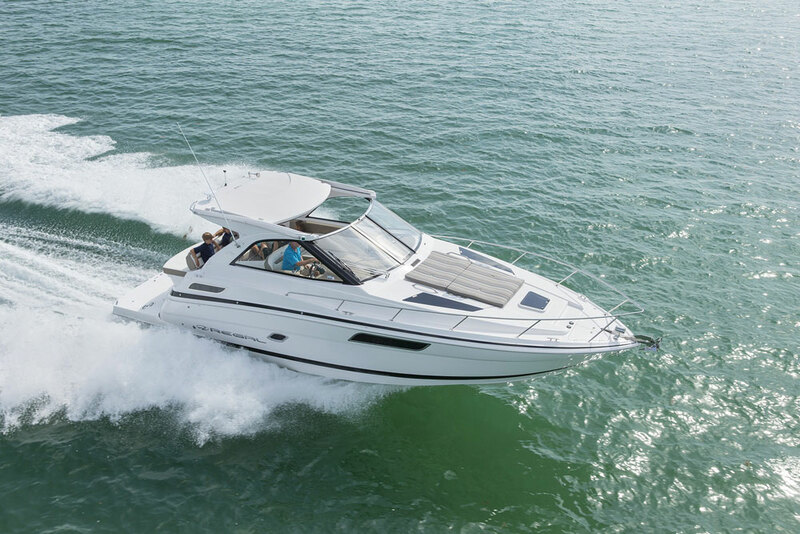 Other Choices: For other outboard powered runabouts that are similar in length and style, check out the slightly larger Sea Ray 310 SLX OB or the Crownline E29 SX. 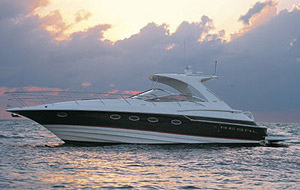 For more information, visit Regal Boats.